Play Thor's Lightning Slot Online with 500 Free Spins! 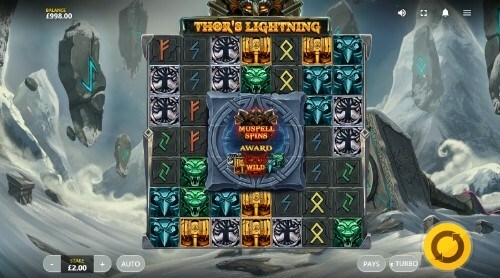 Thor’s Lightning is a 7 reels, 10 paylines online slot game by Red Tiger Gaming. Thor’s Lightning has Wild, Free Spin, Reel Modifier and Collapsing Wins features and an RTP of 96.08%. The best place for players to take on Thor’s Lightning is here at Rose Slots, where we also feature more than 500 great UK online slots including Fluffy Favourites, Starburst, Rainbow Riches and Great Rhino. Red Tiger Gaming, you've done it again. 2019 looks like being a great year for online slot games that play with conventions and traditions, and Red Tiger gaming is pushing it more than most. They've already changed the way we think about wilds with Spin Town; now they're changing the way we think about layouts with Thor's Lightning. The very first thing you'll notice about this stunningly beautiful online slot is the sheer size of it, with its 7x7 layout. We've listed it as having only ten paylines, but that's because it's hard to define what should and shouldn't be classed a payline in this complex slot. It pays out in clusters more often that it pays for lines, with any five matching symbols on the reels whether horizontal or vertical being eligible for the count. Smack-bang in the center of the grid of reels and rows is a huge ‘FREE SPINS’ symbol. It does precisely what you suspect it might do, but the way you trigger it is something we’ve never before encountered in an online slot. We’ll talk about it in the bonus features. The graphics are outstanding wherever you look. We’d take the time to describe the background, but it changes so much it’s hard to settle on just one of them. You might be looking at a desolate tundra of snowy mountains, or you could be looking at a temple of the Gods. This is a super-modern video slot where everything on screen is animated. Red Tiger Gaming has approached their Norse mythology theme with dedication and respect - everything on the reels is tied into Norse legend. The least valuable symbols are four mysterious runes in various colors, and above them are a wolf, an eagle, Thor's legendary hammer, and the Tree of Life, which in Norse myth is called Yggdrasil. You may recognize the word - it's the name of another large developer of online slots! The only other symbol available from within the base game is Thor’s iron helmet. That can substitute for anything else to make a winning combination for you. When Red Tiger Gaming game together in 2014, they had one goal; to change the way people think about online slots. The team behind the company, which operates from the Isle of Man, are all experienced casino world professionals who have worked for other well-known developers but decided that they'd like to do more to push the boundaries. The safe and the familiar don't interest Red Tiger at all - if a concept doesn't play with people's expectations, Red Tiger isn't interested. Thor's Lightning might be the best example of how far from the beaten track they're taking their latest releases, but Spin Town is also a completely novel concept. Even when they go with more familiar themes, as they have in Ancient Script slot game or Cinderella's Ball slot, they still find ways to include the unexpected. They're a development company who are going places and are attracting plenty of attention in the industry. There are two variations on free spins available within Thor’s Lightning, along with a further two random reel modifiers which can occur on any spin, and at the whim of Thor himself, who may put in an appearance to help out with your game. Before we go into any of those bonuses, though, we should also mention that this slot has Collapsing Wins. That means all the symbols involved in a winning line crumble once the win has been tallied, and they’re replaced by new symbols falling in from above. The new symbols may also contribute to winning lines, and therefore will themselves crumble away. The process continues until there are no further winning combinations to be found. We mention this now because it’s very important in the Free Spins round, as you’ll shortly see! Before we get to that, though, we’ll talk about the reel modifiers. The first is Thor’s Lightning, in which the great God Thor literally strikes the reels with lightning. The electrical charge destroys all of the low-value symbols and replaces them with either wilds or matching symbols to create wins. The second is Thor’s Hammer, which will strike the reels and either rearrange the symbols into a series of winning combinations or replace groups of low-value symbols with high-value ones. Either way, wins are guaranteed! Muspell Spins, where you also get a random number of spins, but this time everything’s been taken off the reels apart from the highest value symbols. Unfortunately, Muspell has poured lava over the reels! A lava shower will remove every instance of one of the symbols from the reels, but a full lava flow will add additional matching symbols back on again. Unusual, inventive, original - whatever you want to call the innovative design process behind Thor's Lightning, you can't deny the creativity that went into the process. It may stray a little too far from the regular conventions of online slots games for some people, but if you have a taste for the unusual, we think you'll love it. We cater to everyone here at Rose Slots, and so the conventional and the unconventional sit side by side in our library of online slots.